Founded and still directed by the eminent Russian-born pianist and teacher, Tatyana Dudochkin, New England Conservatory’s 25th Composer Anniversary Celebration Series returned Sunday to Jordan Hall with a plethora of accomplished performers as celebrants. This year’s honoree was Alexander Scriabin, whose death occurred 100 years ago, but curiously, none of his music was heard. We nevertheless had the opportunity to hear the distinguished pianism of the composer’s great-great-grandson, the Israeli-born pianist Elisha Abas (whose résumé even includes a stint as a professional soccer player), and many other gifted musicians in a potpourri of highlights from the past 25 years of Celebrations. Abas opened with the New England Conservatory Youth Symphony, conducted by Steven Karidoyanes, in George Gershwin’s Rhapsody in Blue. Though the pianist was unusually restrained in his movements, his personalized approach to the work featured an impressive range of touch and mood along with the necessary high-voltage virtuosity. Abas’s delectable rubatos, sometimes perhaps spontaneous, made it challenging for Karidoyanes and the orchestra to stay with him at times. Perhaps more body movements could have telegraphed his intentions more graphically. The young performers played expressively and accurately but with rather straitlaced rhythm, perhaps not yet entirely comfortable with the jazz idiom (e.g., the iconic opening clarinet glissando here was simply a scale). Still, the big string tune was rich-toned and glamorous and the ending resounding. After the boisterous applause tapered off, Abas told us that as he was feeling unwell (one wouldn’t have known from his performance) he would not be playing Scriabin for us—to our universal regret—but he did give us an enchantingly beautiful encore in Chopin’s Nocturne in C-sharp Minor. As the stage was reconfigured, our host, veteran radio announcer Ron Della Chiesa, spoke about the remaining pieces on the first half and saluted Dudochkin. The NEC Youth Symphony was then joined by the Masterworks Chorale in a warm-hearted rendition of Giuseppe Verdi’s chorus “Va, pensiero” (Fly, my thought, on wings of gold) from Nabucco. The Chorale also contributed “backup vocals” in the beloved “Meditation” from Thaïs by Jules Massenet. Violinist Yoo Jin Ahn, a very poised high school junior, played with luscious tone and sensuous rubatos, and the muted chorus made the conclusion, in particular, extra velvety. The first half ended with two works by Mikhail Glinka (1804-1857), the first composer to impart a distinctively Russian character to his music. Veteran of the Bolshoi Theater and the Metropolitan Opera, bass Mikhail Svetlov sang “Farlaf’s Rondo” from Руслан и Людмила (Ruslan and Ludmilla). The solitary vocal piece on the program for which no translation was provided, it only gradually became clear (to those of us with no Russian, at any rate) that Svetlov’s dramatic delivery was in fact the bluster of a comical figure, a Finnish knight competing for the hand of Ludmilla. In this powerhouse performance, Svetlov had to subtly pull the orchestra along late in the aria but concluded triumphantly on a ringing high note. Then the Masterworks Chorale and NECYS made spines tingle with the stunning chorus “Slavsya” (Be glorious, my Russia) from A Life for the Tsar. As its title suggests, this is a fervently nationalist outcry, replete with the joyous jangling of tubular bells and glockenspiel, evoking the famous bells of Russian Orthodox churches. The men had heft in the brief “Chorus of Warriors” episode, and the women at the conclusion were equally heroic, sopranos on a sustained high C.
The second half of the program was on a chamber-music scale, beginning with Heitor Villa-Lobos’s bewitching concoction, the “Aria” from Bachianas Brasileiras No. 5, with soprano Yelena Dudochkin (daughter of the series’ artistic director) and cello octet (Sam Ou, Zlatomir Fung, Sophie Applbaum, Andrew Byun, Spencer Kim, Jennifer Su, Lily Moeschel, Yuri Ahn), conducted by Magdalena Richter. The A sections of this ABA form a lovely vocalise and the recapitulation is sung with mouths closed; Dudochkin’s delivery was elegantly legato and even throughout her range, infusing the central section’s Portuguese text with yearning. The cellists gave an emotional tug to their fascinating combinations of bowed and pizzicato playing. Thomas Martin, clarinet; Julianne Lee and Andrew Kohji Taylor, violins; Dimitri Murrath, viola; Sam Ou, cello; and Tatyana Dudochkin, piano played Sergei Prokofiev’s Overture on Hebrew Themes for Clarinet, String Quartet and Piano. This is another ABA format: outer sections had clipped, dotted rhythms, some klezmer influence, and the happy-tragic quality of some Jewish folksong, while the sharply contrasted inner section was lyrical and close to impressionism. The instrumentalists contributed vivid solos; the piano is given little independent material, but Dudochkin created colorful atmospheres throughout—biting and percussive in the A sections, shimmering and liquid in the B. A person without a printed program could be forgiven for thinking that the “Romance” from Dmitri Shostakovich’s Gadfly Suite was Massenet, so closely does it emulate the “Meditation” from Thaïs. Violinist Alexander Velinzon and pianist Tatyana Dudochkin gave a warmly Romantic account with some especially impressive violin double-stops. In Franz Liszt’s “Romance oubliée” (Forgotten Song), an instrumental reworking of a song from 36 years earlier, cellist Sam Ou and Dudochkin played with expressivity and passion; the cello and the piano smoothly exchanged the solo and accompanimental roles several times. The work ended tenderly, high up in the range of both instruments. 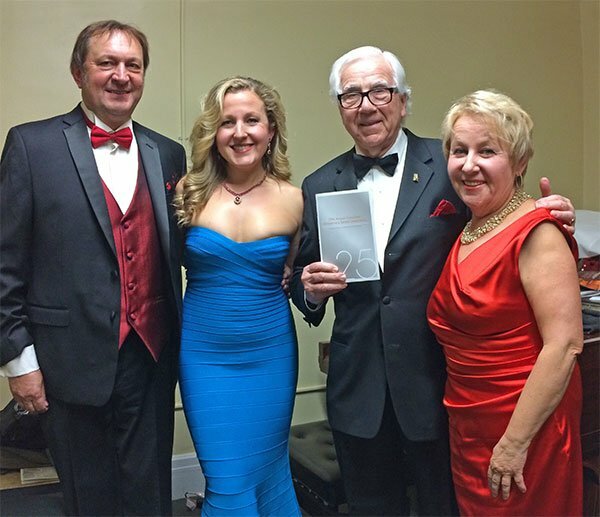 As two concert grand pianos were being maneuvered onto stage, Ron Della Chiesa returned with Yelena Dudochkin, paying tribute to Tatyana and presenting her with a lucite memento of 25 years of the Composers Anniversary Series. Then the evening concluded as three more pianists,Victor Cayres, Lilit Karapetian-Shougarian, and Konstantinos Papadakis; along with percussionist Gary Fieldman, joined Tatyana for the ever-popular “Saber Dance” from Gayane, by Aram Khachaturian. Coordinating eight hands on two pianos is not the easiest thing to do (I speak from experience), but this piece simplifies matters by having a fierce energy that never relents. The performers’ percussive depiction of clashing sabers was thrilling; one hopes they don’t come away with carpal tunnel syndrome. On the page, and in execution, this was quite a lengthy program, but it didn’t feel that way to me: a testament to the well-calculated selection of crowd-pleasers and the high caliber of the performances. Here’s to the next quarter-century of Dudochkin’s wonderful series! And here is another coincidence; the Chaminade concertino for flute will be played again this week with brilliant 19 year old Hayley Miller, student of Linda Toote at BU, with the Boston Philharmonic Youth Orchestra. We will also be playing Schoenberg’s Five Pieces for Orchestra (the first performance ever, we believe, by a youth orchestra anywhere) and Ravel’s Daphnis and Chloe 2nd suite. Sanders Theater at 3 p.m. on Sunday. Plenty of time to get back for the Super Bowl! I attended this concert and thought the Youth Symphony did a wonderful job with the Gershwin and their other pieces, and had to keep reminding myself that they are still young teenagers! They are most deserving of praise and plaudits from everyone. I feel I must take issue with the comment about “straitlaced rhythm” in connection with the Gershwin; I went back to my score to make certain about this (I have studied this piece), and nowhere does the composer ask for anything but straight forward tempos, so if the Youth Symphony was “expressive and accurate” AND with correct tempos and rhythms? Sounds like a win, win and win to me, and it was. Bravo Youth Symphony! And bravo to their conductor for giving his students the opportunity to experience and perform this great music. I hope the reviewer didn’t literally mean “back-up vocals” in reference to the choral singing in Massenet’s “Meditation”. Massenet wrote those chorus parts, and asked that the singers be placed within the orchestra as another “instrument” in the accompaniment. Obviously it was not possible to put the chorus on stage with the orchestra for this performance, but the choral singing is a legitimate and accurate part of the “Meditation”.